Propulsion inverters (VVVF Inverter)｜Transportation Systems Products｜Transportation Systems｜Products Information｜Toyo Denki Seizo K.K. Propulsion inverters (VVVF* inverters) are the control devices that convert the train’s power source to a suitable type of power to drive the traction motors. These inverters convert incoming DC power to AC power as well as control the amount of power (voltage and frequency) being supplied in accordance with the train’s speed, etc. In addition, these inverters are also capable of regenerating power from the motors as the train decelerates. 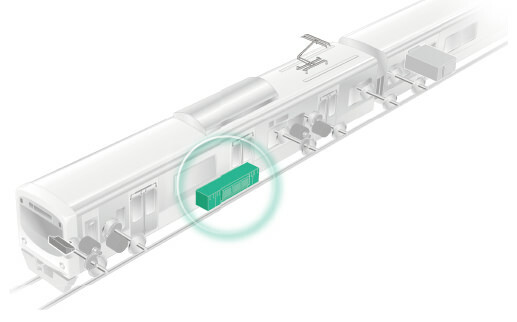 In this way, propulsion inverters help the train smoothly launch, stop, accelerate, and decelerate. Smooth ride comfort: Sensorless vector control is utilized to increase response to the traction motors and adherence to the tracks while keeping wheel spinning and slipping to a minimum. These inverters do not even require motor speed sensors (PG sensors). Low maintenance: Equipped with a device monitor in the control unit, whereby making the operation status continuously transparent and providing for a log of failures. These features help to reduce the amount of maintenance. Power savings: These inverters make it possible to use both generative (resistor consumption) and regenerative (power restoration to the overhead power lines) methods of train control (braking). * VVVF stands for variable voltage variable frequency.